Police are appealing for the assistance of the public in finding a Taser which has fallen from a police vehicle in Lambeth. An officer from the MPS CO19 Firearms Unit had attended a briefing at a firearms base in Norfolk Row, Lambeth on Tuesday, 7 December, between 0700hrs and 0830hrs. During the course of preparing the vehicle for operation after the briefing, the officer placed a Taser on the roof of a marked police vehicle. He then drove away from the base with the Taser still on the roof. At around 1000hrs it was noticed that the Taser was missing. Despite extensive searches, we have been unable to recover the Taser and four cartridges which were with it. Officers believe the Taser would have fallen from the vehicle in the Norfolk Row area of Lambeth, and almost certainly before reaching Vauxhall Cross where the vehicle stopped for fuel. We are appealing for anyone with information as to the Taser's whereabouts to call the Metropolitan Police on 0300 123 1212. 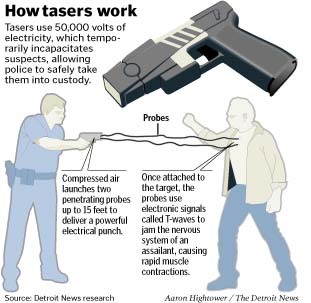 The Taser broadly resembles a handgun in shape, but is constructed of bright yellow plastic. We would ask anyone in possession of the Taser not to handle it, but to call police immediately. An internal investigation is underway. The Directorate of Professional Standards has been informed. The officer has been removed from operational firearms duty.